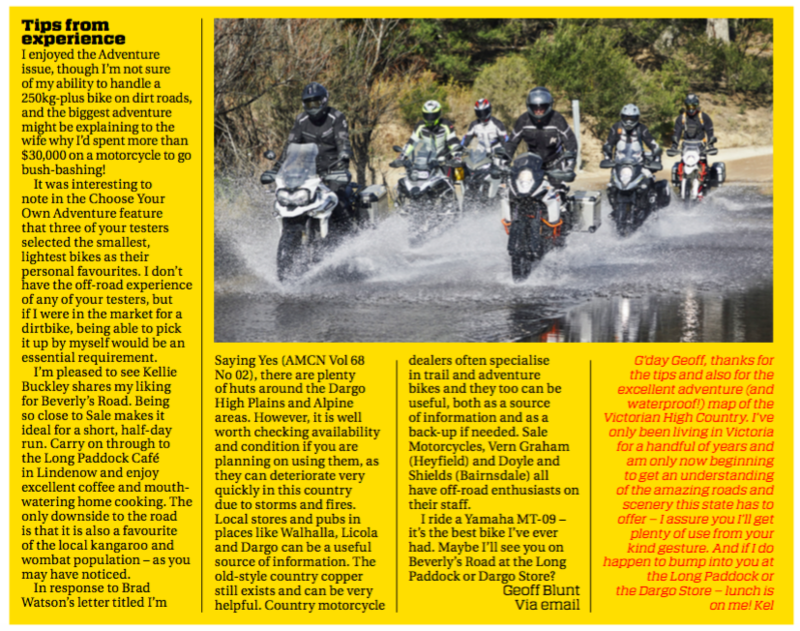 I enjoyed the Adventure issue, though I’m not sure of my ability to handle a 250kg-plus bike on dirt roads, and the biggest adventure might be explaining to the wife why I’d spent more than $30,000 on a motorcycle to go bush-bashing! It was interesting to note in the Choose Your Own Adventure feature that three of your testers selected the smallest, lightest bikes as their personal favourites. I don’t have the off-road experience of any of your testers, but if I were in the market for a dirtbike, being able to pick it up by myself would be an essential requirement. I’m pleased to see Kellie Buckley shares my liking for Beverly’s Road. Being so close to Sale makes it ideal for a short, half-day run. Carry on through to the Long Paddock Café in Lindenow and enjoy excellent coffee and mouth-watering home cooking. The only downside to the road is that it is also a favourite of the local kangaroo and wombat population – as you may have noticed. In response to Brad Watson’s letter titled I’m Saying Yes (AMCN Vol 68 No 02), there are plenty of huts around the Dargo High Plains and Alpine areas. However, it is well worth checking availability and condition if you are planning on using them, as they can deteriorate very quickly in this country due to storms and fires. Local stores and pubs in places like Walhalla, Licola and Dargo can be a useful source of information. The old-style country copper still exists and can be very helpful. Country motorcycle dealers often specialise in trail and adventure bikes and they too can be useful, both as a source of information and as a back-up if needed. Sale Motorcycles, Vern Graham (Heyfield) and Doyle and Shields (Bairnsdale) all have off-road enthusiasts on their staff. I ride a Yamaha MT-09 – it’s the best bike I’ve ever had. Maybe I’ll see you on Beverly’s Road at the Long Paddock or Dargo Store? 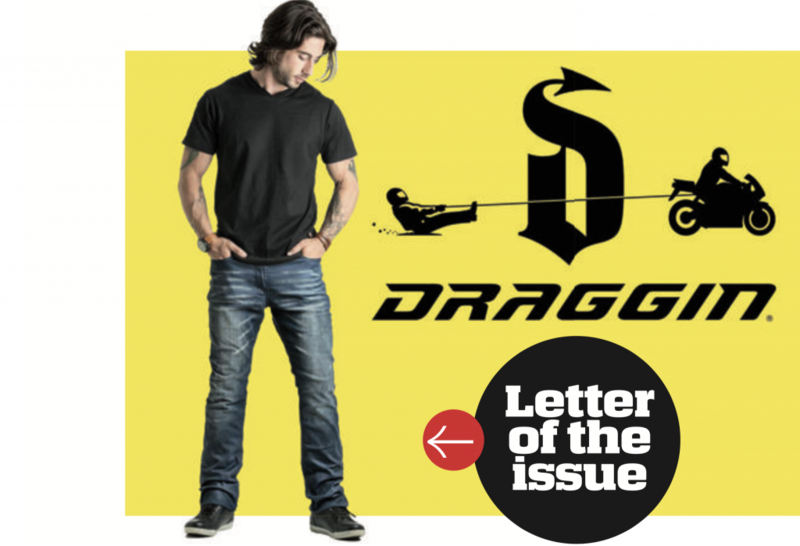 To be in the running to win a pair of Draggin jeans, simply send your thoughts on anything motorcycle related to access@amcn.com.au to get the conversation started.